As those of you who already follow my blog know I am a big fan of the SAGA rules set. I have an Anglo-Saxon war band ready to go. With a few modifications it can become an Anglo Danish war band. I’m also working on a Viking war band. Soon, I will also start on the Crusades era. I have about every block that has been published for the game including the Crescent and the Cross. I’ve also run three tournaments at local conventions. You could say that I really bought into the system and you would be right.So what is up with this Lion Rampant? Easy, it’s also a great set of rules for medieval skirmishing. 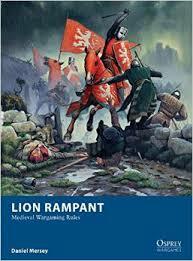 Lion rampant was published 2014 by Osprey books. It was written by Daniel Mersey who also wrote another set of rules published by Osprey called Dux Bellorum. The rules are easy to read because they are written in a friendly manner. It’s sort of like a good friend that sits you down at a table and explains it to you. Physically, the book is 64 pages with some very nice color photographs and color plates from various Osprey publications. About half the book are the rules themselves with the other half comprising things like retinue list scenarios and assorted other topics. The price is quite reasonable at $17.95. Given the amount of color pictures and such it’s a pretty good deal. So how does it work? Each player begins by building a retinue. Each retinue is comprised of units of either six or 12 figures. There are on the average six units in each retinue so were not talking about a large mass of figures like you find in Hail Caesar games. The six-figure units are either mounted troops, dismounted men at arms or bidowers who are a class of skirmishers. The rest are 12 figure infantry units of various types including missile troops. Each type also has special rules and upgrades that can apply. Each unit also costs a certain number of points either four or six depending on the type and upgrades to these units also cost additional points usually a +2. Each player gets 24 points to build their retinue with the only restrictions being that you cannot have more than half of your units in your retinue of a single type i.e. you couldn’t build a complete retinue consisting of nothing but archers.Once you’ve got your retinue assembled it is time to take them to the field in order to vanquish your foe. Both melee and shooting combat also use six sided dice. Interestingly enough each unit regardless of its size gets 12 dice unless it is below half strength in which case it gets only six dice. Casualty resolution is also interesting as you take the number of hits and divide by the target units armor rating to get the number of actual casualties. For example let us say that a unit of Foot Yeoman with an armor of three takes six hits that would result in the removal of two figures as casualties. As you can imagine, the lighter forces with only armor class of one or two can really get mulched. Courage tests are also taken at this time which can result in anything from a unit standing fast to another unit cravenly fleeing the field. And with the way my luck can run it usually happens at the worst possible time to the one unit that I always thought well these guys are my exclusive elite guards there are never going to run… Oh wait… Oh snap… Well there goes my my personal bodyguard. On the other hand you could also have a unit of mere yeomen standing proud you know like the thin red line at the Battle of Balaclava. That’s the beauty of this game you’re not quite sure what you’re going to get you get a pretty good idea but still you’re not quite sure. There are also rules for warlords personality, terrain, how to rally your troops and other topics. There are also a number of sample retinues from various nations. One of the great strengths of this rule set is that you can actually apply it to different parts of the Middle Ages. You can come up with an Anglo-Saxon army from around 800 A.D. all the way up to the late 15th century. I’ve even seen lists and retinues for such diverse topics as the American Civil War and the Zulu War of 1879. In a few months time there will even be a fantasy set of these rules called appropriately enough Dragon Rampant. Now eventually and inevitably someone will ask “well which one do you like the best?” My answer is I like them both equally well. Each game has a different approach to dark ages/medieval skirmish gaming. Interestingly enough, Daniel Mersey, the author of Lion Rampant is also a big fan of SAGA and has stated on occasions that he really likes the game. Conversely, the folks at gripping beast who make SAGA and all of its accessories and figures also like Lion Rampant. Both games are very complementary to one another. They work well and will give you the kind of skirmish gaming experience that you are in the mood for.